VIVO Perfect Fan Contest is hosted by Star India Private Limited in association with VIVO Mobile India Private Limited. All Participants must be valid users of Twitter/ Instagram, as applicable, and must be residing in India on the Contest Days. The Contest will be conducted on the Channels and Network Handles from April 7, 2018 till May 20, 2018. 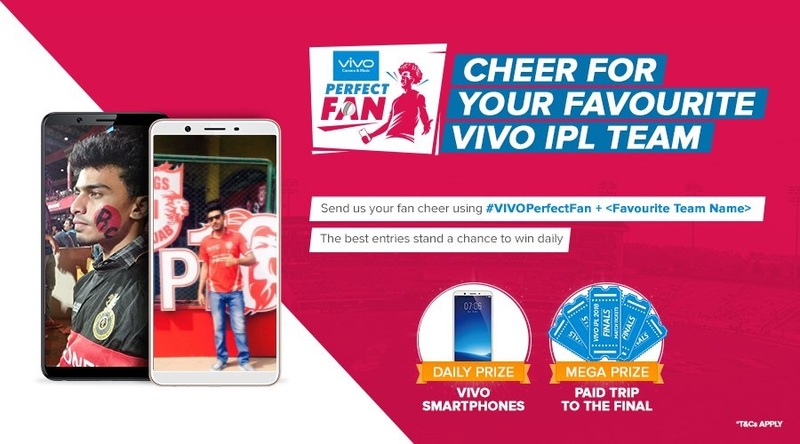 The Participants would have to share their cheers for their favorite VIVO IPL franchise teams in the form of photos, and videos and boomerangs on their social media accounts on the Contest Days. Each Participant is required to visit the Network Handles, as applicable and “follow”/”like” the respective Network Handle. The Participant should submit their entry in the form of a tweet posted through the Participant’s Twitter account, or through a post uploaded through the Participant’s Instagram account in response to the post inviting the Participants to participate in the Contest on the Network Handles. (3) should be submitted on the Contest Days. Any Entry which does not contain all of the elements mentioned in this paragraph shall not be considered a valid Entry and shall be deemed null and void without requirement of any intimation by STAR. STAR shall select 1 (one) lucky winner on each Contest Day (‘Daily Winner’) and five (05) lucky mega winners (‘Mega Winners’) via randomizer for the Contest. Each Daily Winner shall be awarded a mobile phone manufactured by VIVO (“ Daily Prize”). Each Mega Winner will win an all-expenses paid trip for two (2) to watch the final of the VIVO Indian Premier League, 2018 (the “Mega Prize”). The Prize must be claimed in response to messages or telephone calls made to the Winner. CSK is my favourite team and captain cool Dhoni is my favourite player. RCB, you are an excellent team but you can’t win the final. You can win only when your team has Virat as a captain and AB Deviliers as a wise captain. The final match will between SRH vs CSK and CSK will win. Orange cap holder will be Rayudu and Purple cap holder will be Andrew Tye. RCB will win the cup. My favorite team is Mumbai Indians. KKR is the best team in Indian Premium League. CSK will win the IPL cup. CSK is the best team of Vivo IPL. RCB is best but CSK will win trophy. Sunrises is my favorite team. KKR is the best team of IPL 2018. Chennai Super kings is the best team of IPL. CSK will win the IPL trophy 2018 and the players of CSK are very best players like Watson, Rayudu, Suresh Raina, Bravo and Mahendra Singh Dhoni. KKR is this year champion. CSK is my favourite team and best player is Dhoni. All the best Kings 11 Punjab. My favorite team is CSK. CSK is my favorite team. CSK is the best team. Dhoni is my favorite player. CSK will win the final. CSK is my favorite team. My favorite player is Ambati Raidu. RCB will win the trophy. I live VIVO IPL very much. MI IS THE BEST TEAM AND CAPTAIN ROHIT SHARMA IS THE BEST PLAYER. CSK will be win. My favorite player is MSD. Mumbai Indians will win this IPL trophy 2018 and In the KXIP vs MI match , MI will win. I am a big fan of Mumbai Indians. KKR IS THE BEST TEAM & CAPTAIN DK IS THE BEST BATSMAN. I am a big fan KXIP and my dream is becoming a cricket player. CSK IS A GOOD TEAM. IT IS MY FAVORITE TEAM. Dhoni is not only captain, He is also a Thala. My favorite team is always Mumbai Indians. I like Sachin Tendulkar. I like CSK very much and in today’s match CSK will win. KKR is one of the best team. Mumbai Indians will win. I like Sachin. CSK is very good team. I like CSK. RCB IS THE BEST TEAM. I LOVE YOU VIRAT. I am a big fan of RCB. Mumbai Indians is the king of all IPL season. Mumbai Team will win the IPL. MS Dhoni is the best player. CSK will win the IPL. Mumbai Indian will win today’s match. MI (or) RCB, which team will be get selected for playoffs? Punjab team is the winner of IPL 2018. CSK lions are back to smash others. I am a big fan of Rohit Sharma. C.S.K. is the best team in the IPL. CSK will win the match. I am a big fan of MS Dhoni. He is a mind blowing person. My favorite team is Chennai Super Kings. My favorite team is MI but SRH will win the IPL trophy. CSK will win IPL 2018. I am a true big fan of M.S.Dhoni from Kolkata. I am a big fan of Mahi from Gujarat. SRH has a super bowlers, team work and good captain. I support Orange army. I am a big fan of Virat Kholi. He is a mind blowing person. My favorite team is Rajasthan Royal. I am a big fan of Ajinke Rahane. MI is my best Team in the IPL. MI is my favorite team of IPL. Mumbai Indians will win today. All the best Rohit Sharma. I am a big fan of Suresh Raina and CSK team. IPL is the perfect platform for new upcoming player’s good to Indian cricket. I am big fan of Delhi Dare Devils. CSK is my favorite Team and Suresh Raina is the best player. Chennai Super Kings will win the final match. MI IS THE BEST TEAM.TODAY MI WILL WIN THE MATCH. MI BATSMANS CONFIDENCE IS BACK ONCE AGAIN. I am a big fan of CSK and MS Dhoni. This time RCB will win and Virat Kohli will get the best captain award. I AM A DIE-FAN OF RCB. CSK will win the IPL 2018 cup. I am a big fan of Chris Morris. RCB will win the IPL cup. Mumbai Indians is the best team of IPL. SRH WILL WIN THIS SEASON. GOOD LUCK SRH. In this session of 2018, Kings XI is looking good team, may win IPL Trophy. SRH team has best bowling lineup. RCB will win this match. Mumbai Indians is the best team. CSK is the best team. MS Dhoni is best. No one player like MS Dhoni. I am a big fan of Chennai Super Kings. MI is the best team. RCB is best and perfect team. Mumbai Indians is my favorite team and Rohit Sharma is the best player of IPL 2018. CSK will win the trophy of IPL 2018. I am a die hard big fan of Chennai Super King. Mumbai Indians will win the match. MI is Best. I am a big fan of Rohit. Happy Birthday Sharma. MI is the best team of VIVO IPL 2018. RCB is the best team. I am a big fan of #THALA DHONI. CSK is always the best team. All the best CSK. BEST OF LUCK MI TO BEAT SRH. I am a fan of #CSK. CSK will win IPL this year. I am a big fan of Mumbai Indians. I like VIVO IPL specially I like RCB team. All the very best RCB. CSK will win today. All the best team. All the best CSK & SRH. I hope MI will win in the today’s match. CSK team is very balance team. KKR will win the IPL 2018 cup. Mumbai Indians will win the 2018 VIVO IPL Trophy. VIVO smart phones are best. I am a big fan of KKR. MS Dhoni is the best player of IPL 2018. Chennai Super Kings is the best team and Captain cool MS Dhoni is a best player.